Its come to my attention that some of the local Post Offices are not going to be delivering everyday- due to cut the financial drop they are dealing with.. I am aware of everyone going ELECTRONIC.. and silly me thought for a moment that maybe with their competitive edge with the package mail- they could compete with Brown, Yellow and the other - I guess I was wrong! This really is heartbreaking - since I really try my best to keep in the mailing system. I mail cards.. from Thank you to Birthdays, silly holidays in between - not only for my love of cardmaking - but the excitement I get when the recipients acknowledges they have received it! Sure, I am guilty of my electronic payments and when I shop online I select the USPS when I can.. so I am doing my part... I cannot save the post office myself but I figure every little bit matters. 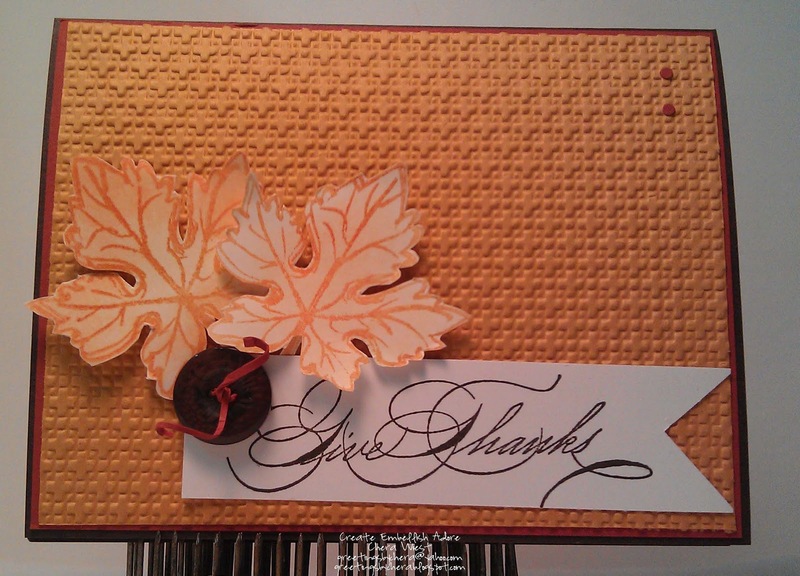 I elected to make a 10 card bundle of these Give Thanks in fall colors not only for my postmaster but to mail out to a few other people. I used the Handpenned Sentiments in Espresso, on White. 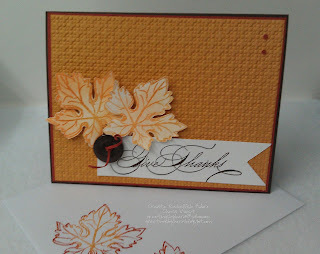 I have been waiting to use those Gently Falling two step stamps - in which I LOVE! I used the Pastels in More Mustard and Pumpkin Pie. 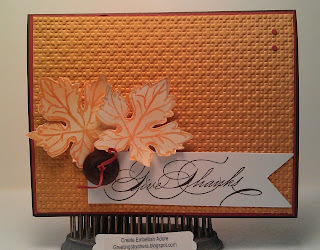 The CS base is Expresso with Cajun Craze layered before the Lattice Embossing Folder in More Mustard. I cut out the leaves, used dimensions. Added an Espresso button with a sliver of Cajun craze laced thru it. 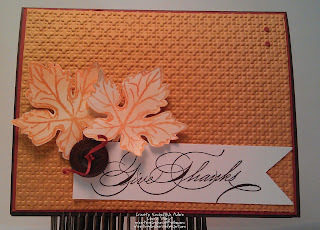 ﻿I stamped some leaves on the envelope in More Mustard and Cajun Craze - using the Rock n Roll technique! How fun!! MAIL OUT A CARD TODAY!!! What a beautiful card for the postmaster, I'm sure they will love it! Gorgeous colors. 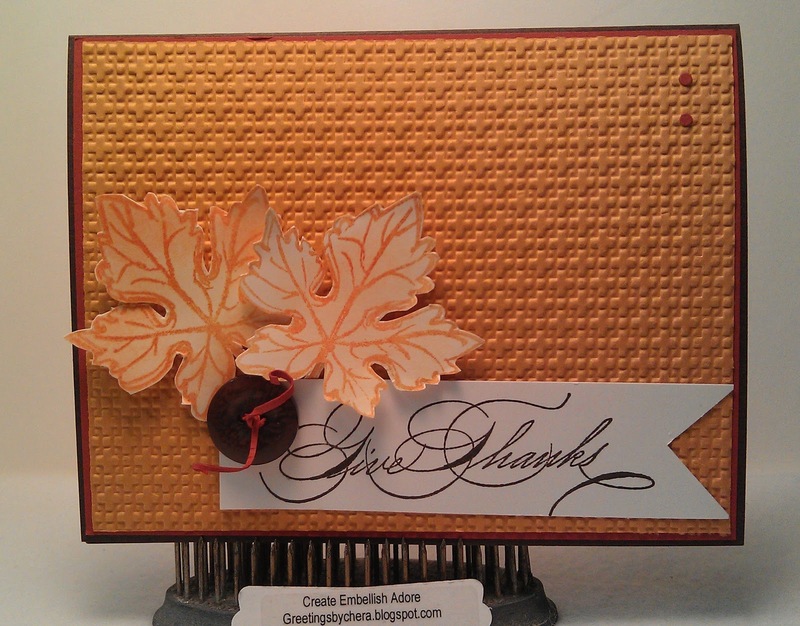 Beautiful card, I just love fall colors. We don't much of that out here in L.A. Fabulous cutting job on those flowers.